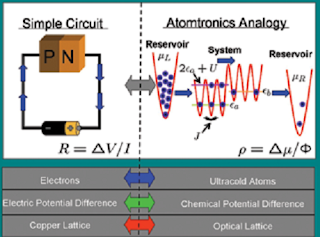 Atomtronics refers to the process of creatinganalogues to electronic devices and circuits using atoms. When super-cooled toform Bose-Einstein condensates, atoms placed in an optical lattice may formstates analogous to electrons in solid-state crystalline media such as semiconductors.Impurity doping allows the creation of n and p-type semiconductor analoguestates, and an atomtronic battery can be created by maintaining two contacts atdifferent chemical potentials. Analogues to diodes and transistors have alsobeen theoretically demonstrated. Although atomtronic devices have yetto be realized experimentally, the properties of condensed atoms offers a widerange of possible applications. The use of ultra-cold atoms allows for circuitelements that allow for the coherent flow of information and may be useful inconnecting classical electronic devices and quantum computers. The use ofatomtronics may allow for quantum computers that work on macroscopic scales anddo not require the technological precision of laser controlled few ioncomputing methods. Since the atoms are Bose condensed, they have the propertyof superfluidity and, therefore, have resistance-less current in which noenergy is lost or heat dissipated, similar to superconducting electronicdevices. The vast knowledge of electronics may be leveraged to easily adapt toultracold atomic atomtronic circuits. Forgetabout wires, silicon and electricity. Physicists have developed a new type ofcircuit that is little more than a puff of gas dancing in laser beams. Bychoreographing the atoms of this ultracold gas to flow as a current that can becontrolled and switched on and off, the scientists have taken a step towardbuilding the world’s first “atomtronic” device. Atomtronicsis a young, small and mostly theoretical field based on the idea that atoms inunusual quantum states of matter may provide an alternative to thetried-and-true electron for making useful devices. The field’s proponents havedrawn up blueprints for atomic versions of many traditional electroniccomponents — from wires and batteries to transistors and diodes. At theJoint Quantum Institute in Gaithersburg, Md., graduate student Anand Ramanathanand his colleagues hope to use an ultracold gas called a Bose-Einsteincondensate to make atomtronic sensors. In an upcoming paper in PhysicalReview Letters, the team reports creating this gas by cooling sodium atomssuspended in magnetic fields. The researchers then trapped the atoms in a pairof crossed laser beams and further chilled the atoms to less than 10 billionthsof a degree above absolute zero. The two beams also shaped the condensate thatformed at these low temperatures into a flattened doughnut with a radius ofabout 20 micrometers. A secondpair of lasers transferred energy to the doughnut to start it rotating. Becauseatoms in the condensate behave as a single, coherent quantum particle, such aring of the substance doesn’t speed up or slow down gradually — it jumpsbetween different speeds, much like a blender would if it could change settingsinstantaneously. 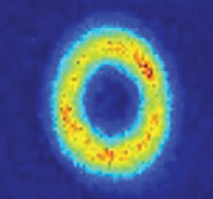 The scientists chose the lowest setting for their ring, aboutone revolution every second. Becausethe condensate also happens to be frictionless, this ring should, in theory,rotate forever. Limited by technical difficulties, the research team kept itgoing for about 40 seconds, the lifetime of their condensate. Her first idea for a useful device was inspired bysuperconducting quantum interference devices, commonly known as SQUIDs. Thesedevices reveal the presence of very weak magnetic fields by detecting suddenchanges of current in semiconductor loops. Using asimilar principle, Campbell’s team believes that Bose-Einstein condensate couldprovide an extremely sensitive rotation sensor. They added a “weak link” totheir condensate ring — a barrier created by a blue laser that could speed upor shut down the flow. Theoretically, if the condensate were kept still and thebarrier attached to a rotating sensor, the barrier would cause a sudden jump incurrent at certain rotation speeds. Theteam’s approach to creating an atomtronic device is only one of half a dozenbeing pursued in laboratories around the world. “They’ve added another toolthat we can start to use to build up the atomtronics toolbox,” said DanaAnderson, a physicist at the University of Colorado at Boulder. All ofthese pioneers hope that, for certain applications, atoms will prove to be moreinteresting than electrons. 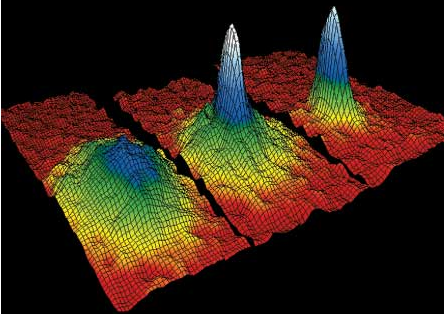 wasn’t until 1995 that scientists made a Bose-Einsteincondensate, using lasers to carefully cool rubidium-87 atoms down totemperatures less than a millionth of a degree above absolute zero. The 2001Nobel Prize in Physics celebrated this accomplishment, which was also achievedusing sodium atoms. This image shows the distribution of atomic velocities in arubidium gas just before (left) and after (center and right) the formation of acondensate.